At a glance, it looks like the "Company" and "Site" criteria need to be moved to the "ANY of these conditions" can match region. AND the Company is "Datalogic do Brasil Ltda" AND the Company is "Datalogic USA, Inc." AND the Company is "Solution Net Systems, Inc."
AND Site is "Jundai" AND Site is "Quakertown" AND Site is "Sao Paolo" AND Site is "Telford"
AND the Company is "Datalogic do Brasil Ltda" OR the Company is "Datalogic USA, Inc." OR the Company is "Solution Net Systems, Inc."
AND Site is "Jundai" OR Site is "Quakertown" OR Site is "Sao Paolo" OR Site is "Telford"
Better to test it first, but take my word with a grain of salt, I could be wrong... try putting both the "Company" and "Site" criteria into the "ANY of these conditions can match a try" region. the point is that it's not clear to me if the "ALL" criteria is an "AND" and the "ANY" criteria is an "OR"!!! I just wanted to confirm with set of rules you are editing/using. There are the SLA rules that are used for applying the SLA and there are Service Level rules for applying the Service Level after the SLA has been applied. 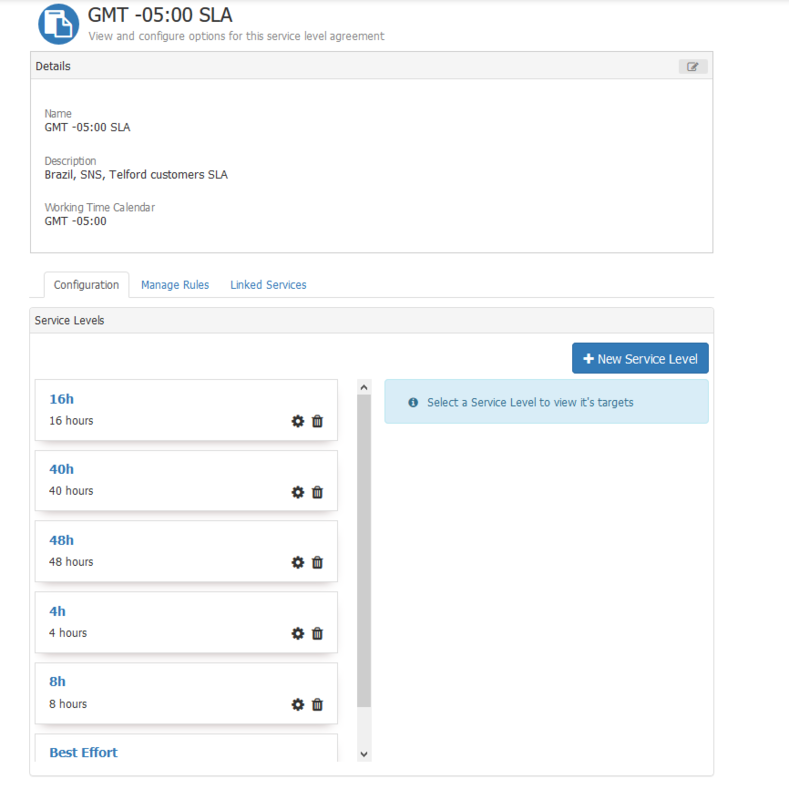 The SLA rules can be seen once there are more than one SLA assigned to a Service. It might be that you are looking to set up a rule here just for the company and site to set the correct SLA based on timezone. 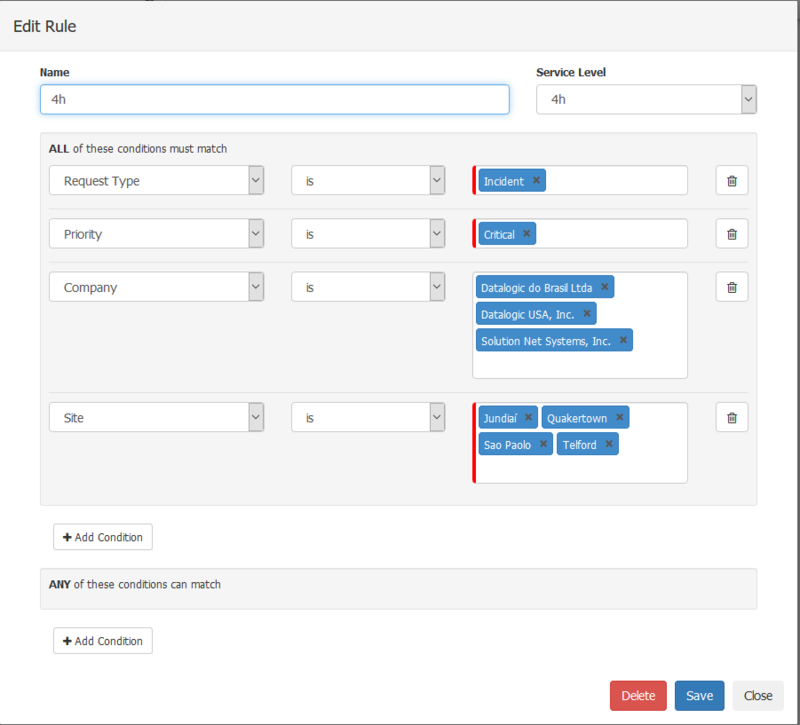 Then, within the Service Level Rules (for example in your screen shot above for 4h Service Level) you should only be looking for the request type and priority for your conditions. Am i understanding correctly or not? and also how are evaluated the "All of these condition must match" and "Any of these conditions can match"? I mean "All of these condition must match" must match but in addition it will evaluate one of the "Any of these conditions can match"?!? could you help me to clarify it better? how are evaluated the "All of these condition must match" and "Any of these conditions can match"?